Cross Section Chief Executives of Culture and Tourism at the National Council on Culture, Tourism and National Orientation. Otunba Olusegun Runsewe, Director General, National Council for Arts and Culture (NCAC) has revealed his intention of taking all the Commissioners in-charge of culture in the states as well as the Secretary of the Social Development Secretariat of the Federal Capital Territory (FCT) on familiarization tours within and outside Nigeria. 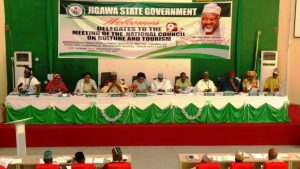 He mooted this idea recently at the 9th Edition of the National Council on Culture, Tourism and National Orientation with the theme: “Tourism and Culture As Panacea for Nigerian Economic Recovery”, in Dutse, Jigawa state, Nigeria. Buttressing his point, he cited examples of the Chinese Cultural Revolution and the Asian World Cultural Revolution which according to him preceded their emergence as highly productive economies today referred to as the “Asian Tigers”. Runsewe also harped on the Council’s plan to establish Arts and Crafts Cultural Club in Schools (Zonal) noting the Club will aim at youth cultural enlightenment and knowledge transmission in an attempt to provide a platform for the inculcation of values of national pride in youths, engender friendship across ethnic and religious divides as well as promote the appreciation and respect of our diversity. “It is quite clear that when a youth is properly groomed and trained to imbibe good attributes of our traditional values, as being our brother’s keeper, respect for elders and constituted authority, humility, discipline, hard-work, honesty, communal efforts and so on, such youth will not indulge in vices such as cultism, violence, prostitution, corruption, examination malpractices and other anti-social behaviours”, the NCAC chief added. Runsewe further threw more light on NAFEST and AFAC saying both programmes possess great potentials capable of driving Nigeria’s economic recovering efforts while soliciting the collaboration and support of Council towards their sustainability noting that the envisaged assistance will enable NCAC scale up and introduce new innovations aimed at stimulating domestic and global interest that would tremendously impact on our tourism and boost our economy. He said cities like Edinburgh annually organizes twelve festivals, attracting well over one million visitors with its most famous festival being the Edinburgh International Festival and the Fringen which is the largest annual international arts festival in the world. 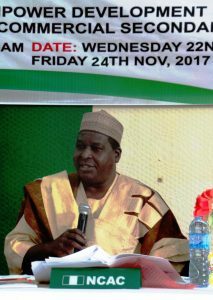 Speaking further, Otunba Runsewe said the twelve festivals generate over 170 million pounds for the city and 184 million pounds for the Scottish economy collectively. The Brazilian Rio de Jeneiro carnival which annually creates about 250,000 jobs attract more than a million local and international visitors and contributes over 800 million dollars to the State’s economy. Accordingly, it is estimated that Brazil earns about 3.2 billion dollars annually, mostly from its carnivals, thus putting the carnivals in the same league with the Olympics, which Price Waterhouse and Cooper estimated to have contributed 3 billion pounds to the British economy in 2014.